Grilled lettuce and greens might seem a little out of the ordinary if you’ve never done it before, but trust me, it’s the best way to enjoy salad in the summer. I’ve done a Grilled Caesar Salad before, which is what got me started with this salad-on-the-grill kick. The vinaigrette can be made in advance, and makes about double what you need; store the leftovers in a covered jar in the refrigerator for up to a week. 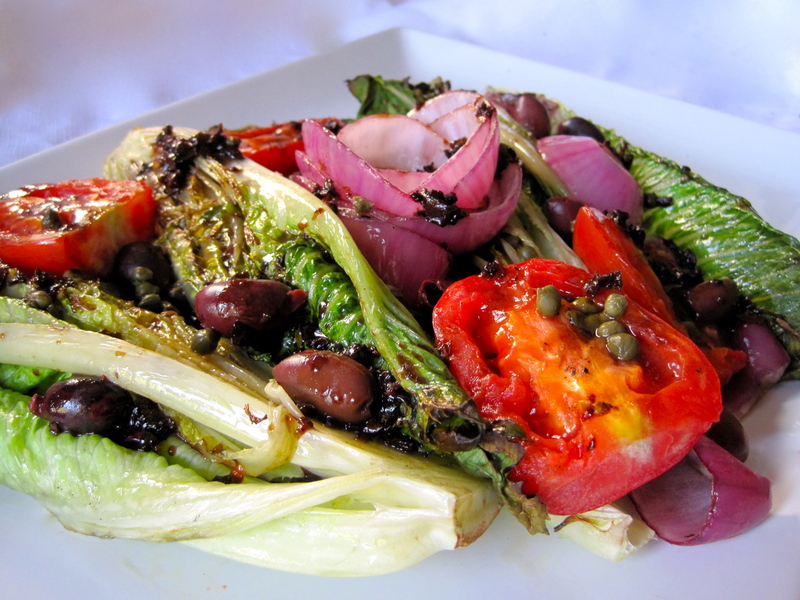 To make the salad, brush olive oil on the cut sides of the onion, tomato and romaine hearts. Sprinkle with salt and pepper. Heat the grill to medium high heat. Put the red onion, tomatoes, and romaine on the grill. Cook for about 5 minutes per side, keeping a close eye and checking the underside of each one to ensure it is grilled, but not charring. Remove from heat. Put the vegetables on a serving platter. Sprinkle with olives and capers. Let sit while making the dressing. Put the sundried tomatoes in a small bowl. Cover with the boiling water and let sit for about 5 minutes, until softened. Drain, then finely chop. Put that tomatoes back in the bowl and add the balsamic vinegar and garlic. Mix to combine. Add the oil in a stream, mixing constantly, to emulsify the mixture. Pour over the salad ingredients. Serve immediately. A spicy marinade has a kick of cayenne, along with sweet apricots and a tang of Dijon. You can also fire up the grill, cut the tofu into chunks and spear it on skewers for a barbecued version of this easy protein- and flavor-rich dish. Put the apricots, garlic, water, maple syrup, Dijon mustard and cayenne pepper in a food processor. Process until smooth. 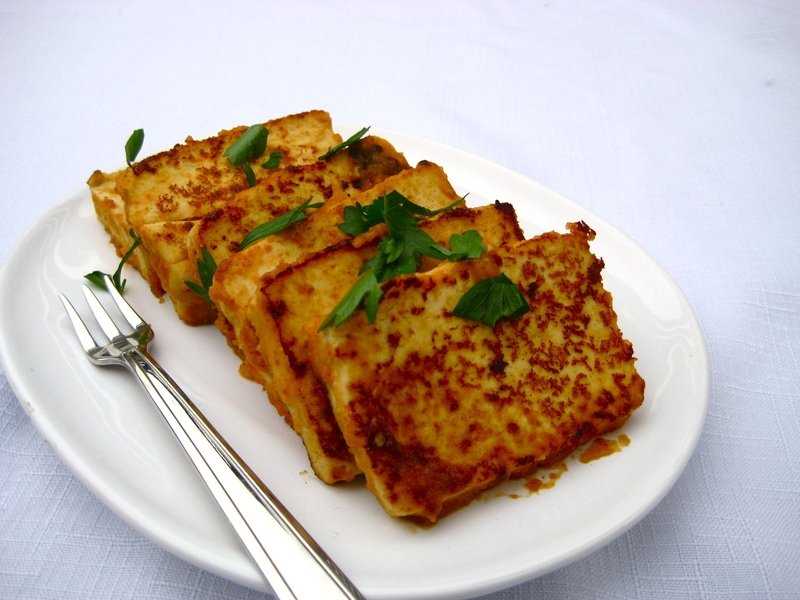 Slice each block of tofu into six slices. Pour a little marinade into a long container. Add the tofu in a single layer, then top with the remaining marinade. Refrigerate for at least 2 hours. When ready to cook, heat the oil in a skillet over medium-high heat. Add the tofu and fry until crisp, about 4 to 5 minutes per side. Serve warm. This Swedish dish takes its name from Hasselbacken, the Stockholm restaurant where the original — with baking potatoes — was served. If you don’t wrap them and bake them at 400°F (200°C) in the oven, they get a nice crispy texture, instead. The must-have side dish to these grilled stuffed peppers. For the sour cream, after pureeing the tofu, add salt and lemon juice to taste. After a few hours in the fridge, the flavours will mellow with the onions. Chives are a great addition, too. Preheat one side of the barbecue to medium heat. Leave the other side off. Make several slits in the potatoes (about 15 to 20). Mix together the olive oil and crushed garlic. Drizzle it in the slits in the potatoes. Top with the onions and thyme, making sure to get into the slits. Season with the salt and fresh ground pepper. Wrap each potato in aluminum foil. Put the potatoes on cool side of the grill and close the lid. Let roast approximately 35 minutes. They will be soft and bottoms will be slightly caramelized. Top with Pseudo-Sour Cream. Put the tofu in a blender or food processor. Puree until smooth. Stir in half of the lemon juice and a few pinches of salt. Add the green onions. Mix well, then add additional lemon and salt to taste.